I had this infra-violet scrap, and had to use it! 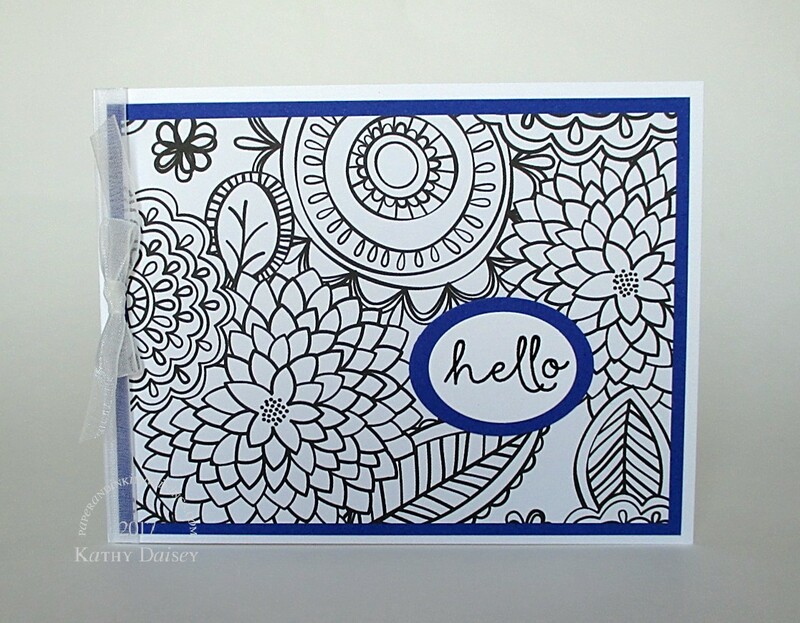 Supplies: Stamps – Papertrey Ink, Waffle Flower, paper – Neenah Classic Crest Solar White, PopSet Infra Violet, PopTone Sour Apple, Stardream Metallic Silver, inks – VersaFine Onyx Black, VersaMark, die – Taylored Expressions, embossing powder – Stampendous Detail Clear. 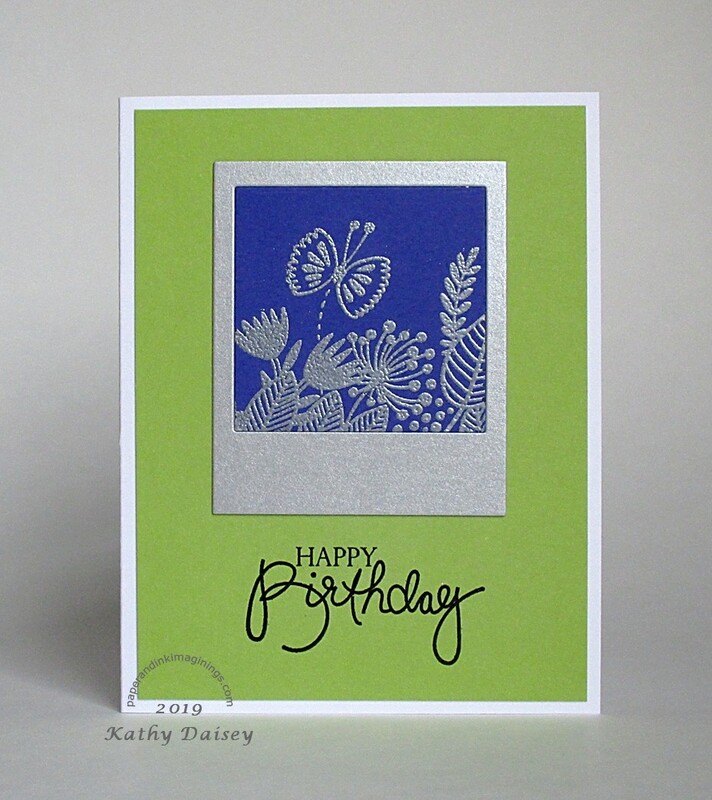 Categories: birthday, card | Tags: card, Neenah, Pop'Set, Pop-Tone, Stampendous, Taylored Expressions, Tsukineko, VersaFine, VersaMark | Permalink. 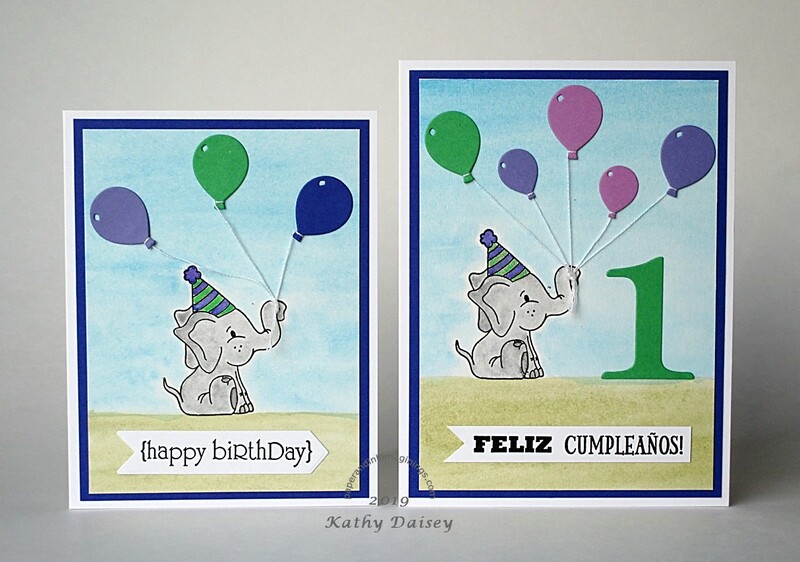 Offspring3 requested the card on the right for a little friend. For the balloon strings, I separated a piece of embroidery floss into the 6 individual strands, and used a needle to “sew” them through the paper (and back to the front again) to tie around the elephant’s trunk. The most difficult time was getting the “feliz cumpleaños” sentiment straight. Each word is an individual stamp (Hero Arts). With them being different fonts, even with the MISTI (and multiple grid template options to line them up!) it took me more than 5 tries to be satisfied. Supplies: Stamps – Hero Arts, Papertrey Ink, Simon Says Stamp, paper – Canson watercolor, Malmero Perle green, Neenah Classic Crest Solar White, Pop Set Infra Violet, Stampin’ Up! Lovely Lilac (retired), Orchid Opulence (retired), inks – VersaFine Onyx Black, ZIG Wink of Stella clear, watercolors – Sakura Koi, dies – Papertrey Ink (one), Taylored Expressions (balloons, banner (left)), embossing powder – Filigree Fine Art Powder clear, floss – Iris. 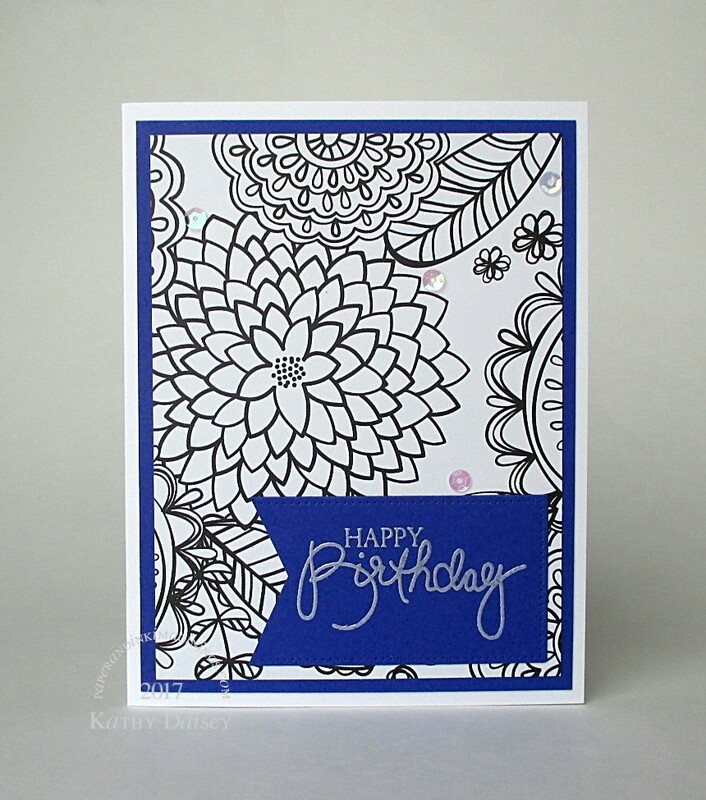 Categories: birthday, card | Tags: Canson, card, Hero Arts, Iris, Malmero, Neenah, Papertrey Ink, Pop'Set, Simon Says Stamp, Stampin' Up!, Taylored Expressions, Tsukineko, VersaFine, ZIG | Permalink. This bright bouquet is for my Aunt. I am in love with this purple paper. I only bought a sample pack (years ago! ), so I am hoarding it! 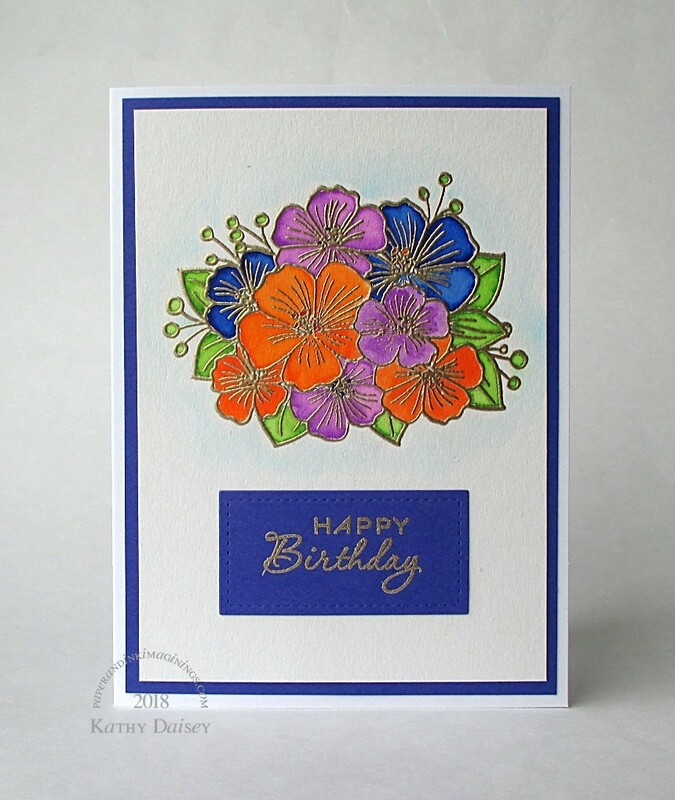 Supplies: Stamps – Avery Elle, Papertrey Ink, paper – Canson watercolor, Neenah Classic Crest Solar White, Pop Set Infra Violet, inks – VersaMark, ZIG Clean Color Real Brush Pens Blue (030), Cobalt Blue (031), Light Green (041), Light Violet (081), Orange (070), die – Lawn Fawn, embossing powder – Stampendous Gold Detail. 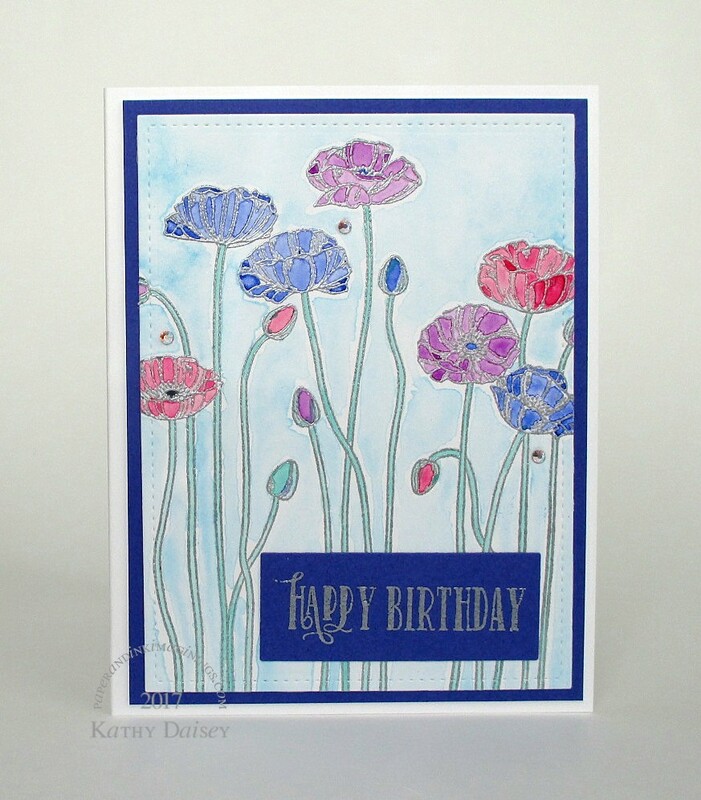 Categories: birthday, card | Tags: Avery Elle, Canson, card, Lawn Fawn, Neenah, Papertrey Ink, Pop'Set, Stampendous, Tsukineko, VersaMark, ZIG | Permalink. Gosh, I love this Infra Violet paper! TGIF for me…have a great weekend! Supplies: Stamp – Essentials by Ellen, paper – American Crafts Amy Tangerine Better Together, Neenah Classic Crest Solar White, Pop’Set Infra Violet, ink – VersaFine Onyx Black, dies – Lawn Fawn, embossing powder – Filigree Fine Art Powder clear, organdy ribbon – Offray. Categories: card, encouragement, thinking of you | Tags: American Crafts, Amy Tangerine, Better Together, card, Essentials by Ellen, Lawn Fawn, Neenah, Offray, Pop'Set, Tsukineko, VersaFine | Permalink. I love this black and white floral paper by Amy Tangerine. I paired it with a beautiful purple today. Supplies: Stamp – Hero Arts, paper – American Crafts Amy Tangerine Oh Happy Life, Neenah Classic Crest Solar White, Pop’Set Infra Violet, ink – VersaFine Onyx Black, dies – Spellbinders, embossing powder – Filigree Fine Art Powder clear, organdy ribbon – Offray. 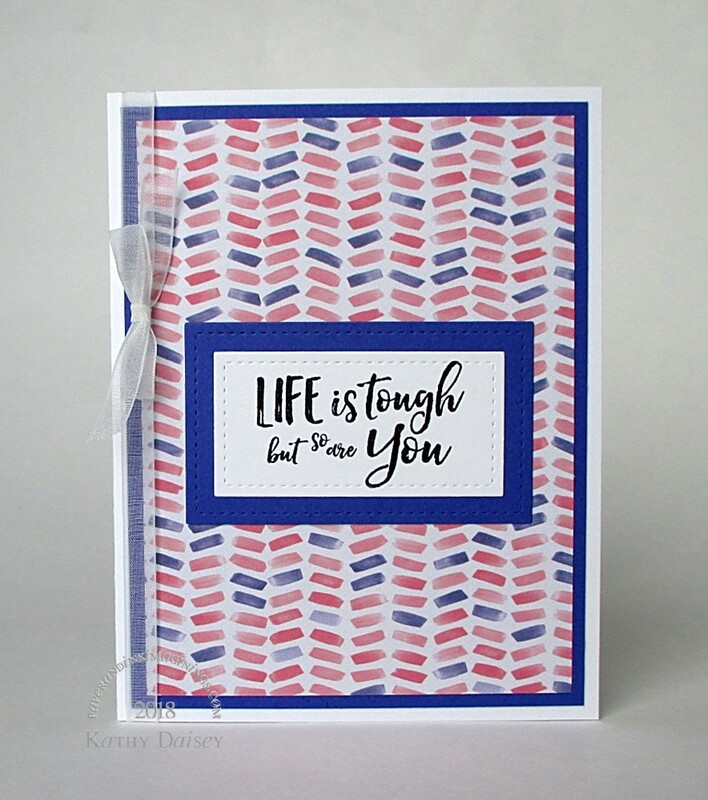 Categories: card, caring, encouragement | Tags: American Crafts, Amy Tangerine, card, Hero Arts, Neenah, Oh Happy Life, Pop'Set, Spellbinders, Tsukineko, VersaFine | Permalink. Another Amy Tangerine background – from her Oh Happy Life collection. Supplies: Stamp – Papertrey Ink, paper – American Crafts Amy Tangerine Oh Happy Life, Pop’set Infra Violet, ink – Hero Arts Unicorn, die – My Favorite Things (pierced rectangle), sequins – Darice, embossing powder – Ranger Silver Pearl. Categories: birthday, card | Tags: American Crafts, Amy Tangerine, card, Darice, Hero Arts, My Favorite Things, Neenah, Oh Happy Life, Pop'Set, Ranger | Permalink.